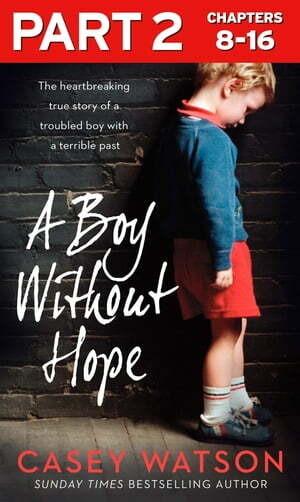 Collins Booksellers - A Boy Without Hope: Part 2 of 3 by Casey Watson, 9780008298579. Buy this book online. A BOY WITHOUT HOPE is the heart-breaking story of a boy who didn’t know the meaning of love. A history of abuse and neglect has left Miller destined for life’s scrap heap. But in this turbulent story of conflict and struggle, Casey Watson is determined to help Miller overcome his demons, show him love and give him hope. Casey Watson is back, doing the job she does best – rolling up her sleeves and fostering the children who, on first meeting, seem like hopeless cases. But when she meets Miller and discovers the truth about his disturbing childhood, even Casey begins to doubt if this child will ever be able to accept love. Found naked and alone on a railway track, Miller was just five when he was first admitted into the care system. Emotionally tormented by his biological parents, Miller has never understood how to establish meaningful relationships, and his destructive past, and over 20 failed placements, is sealing his fate in society’s social scrap heap. After a torrent of violent behaviour and numerous failed attempts to help Miller, Casey decides to make an intervention, implementing a severe regime that strips Miller of all control. But soon the emotional demands of Miller’s case start to take their toll on Casey and Mike. Just how far is Casey willing to go to help Miller and save him from his inner demons?